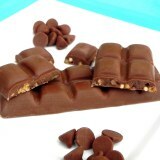 Our Chocolate Dream bar is a dream come true! This creamy, milk chocolate bar contains just 6 carbs and 10 grams of protein. Chocolate Dream Bars are a Specialty product which means they may be enjoyed 1-2 times per week while on the ITG Diet Plan. Break into small squares and enjoy a little taste of chocolate all day long! Please note this bar can melt in the heat. Product may be unavailable during hot summer months.